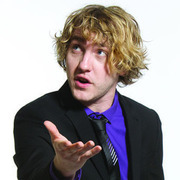 Seann Walsh first came to my attention back in 2008 when he almost won the Amused Moose Laugh Off and his career has really taken off since then with numerous TV appearance including Mock the Week for example. Playing in a packed out sweatbox of a basement for this years show, Walsh comes across as a nice friendly guy in spite of the scary female latecomer who wanted to join in far too often. As a young 25 year old a lot of his material is centred around technology, TV and some social networking observations and his well crafted set kept everyone included and there was no obvious weakness in any of his material. If I had a criticism perhaps some was perhaps a little too safe. The section of TV cookery programmes was for me the highlight, especially his idea of a drunken late night cookery programme for those back from the pub. Walsh is young, with bags of energy and oodles of personality. I look forward to seeing him for years to come.